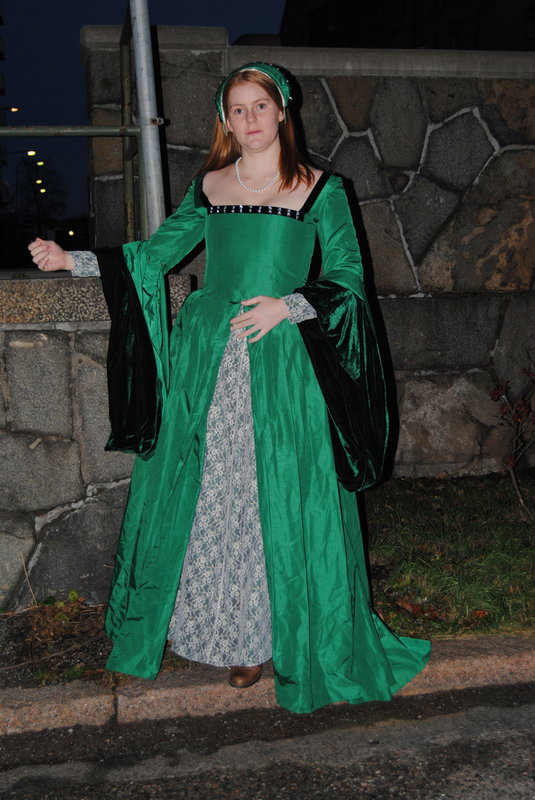 About 5 years ago I decided to try my hands at historic costuming for the first time. I’ve always loved historical movies and don’t really care about the plott or the actors performance as long as you can look at some beautiful costumes. So when the movie “The Other Boleyn Girl” came out I fell in love with the beautiful costumes the leading actresses wore. I must say I still think they are lovely even though I now realize they in no way resembles what women of the time realy wore. 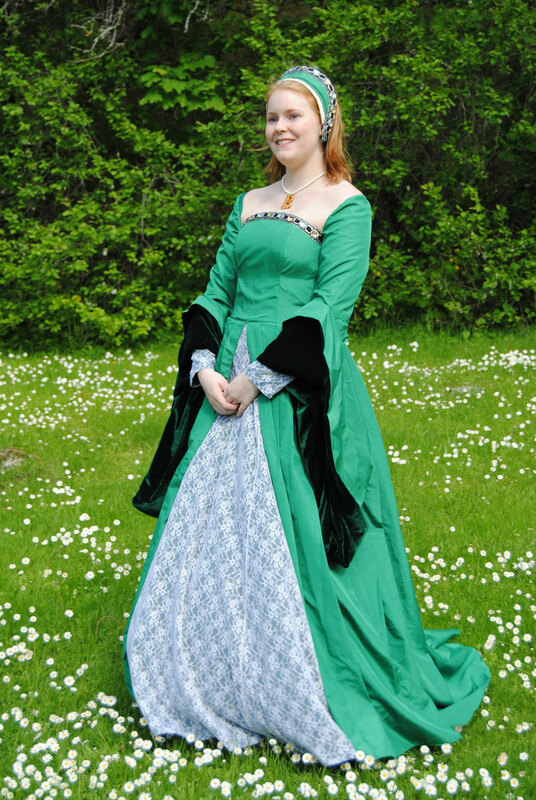 I decided that I really wanted to make the green dress Anne Boleyn/Natalie Portman wears when she reurns from France and starts to seduce the king (Henry VIII/Eric Bana). 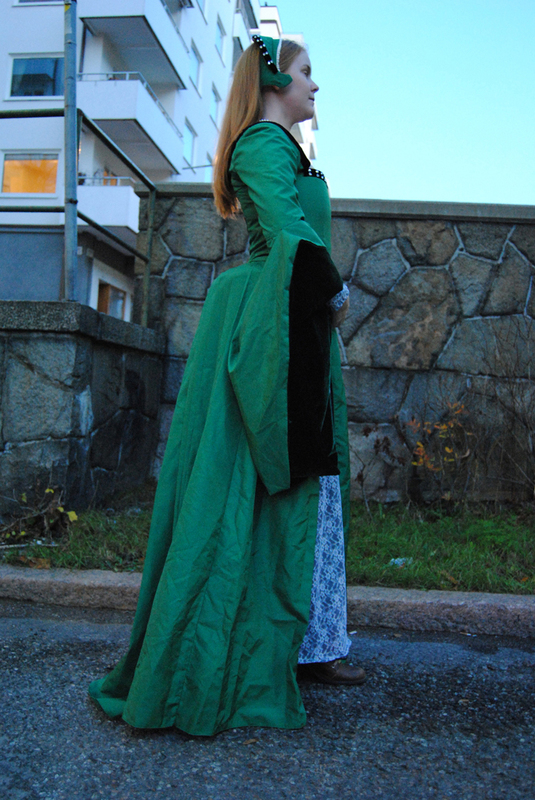 I bought 5 m of emerald green taffeta, some dark green velvet and some lace – all of course in polyester. Back then I knew nothing about historical pattern-making and the importance of foundation wear, but realied on my “skills” at modern pattern making. 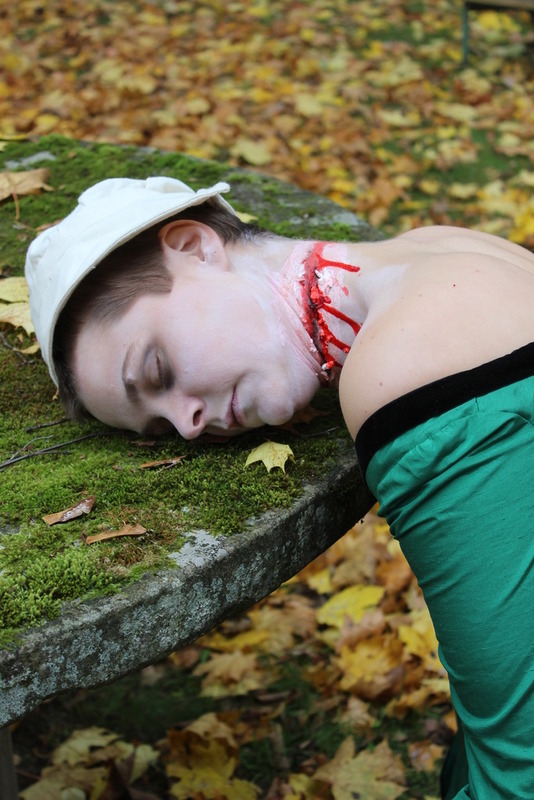 After studying pictures from the movie and the exibition of the costumes I started drafting the pattern. 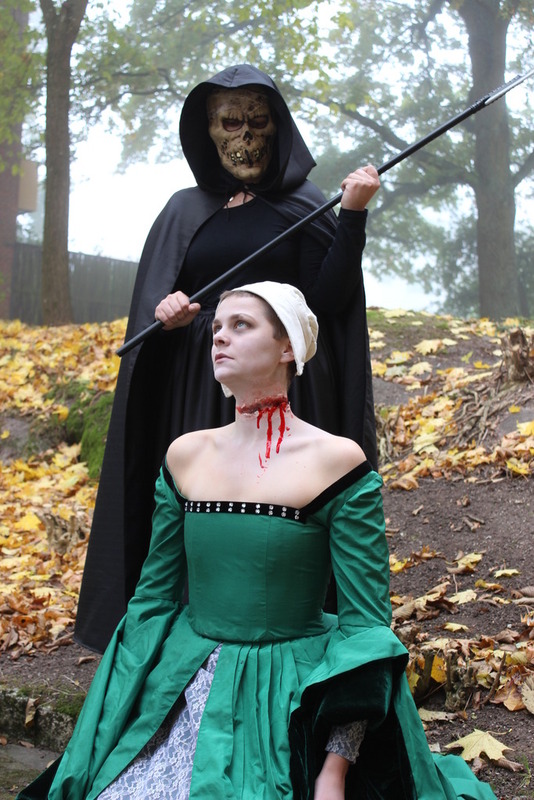 I made the bodice as an sleeveless gown with a higher back and the sleeves attached only at the armpitt. It closes in the back with a zipper. The lower parts of the sleeves consists of a big rectangel lined with the velvet, sewn into the elbow seam. I cut the skirt as two rektangles and pleated them to the waist of the bodice. 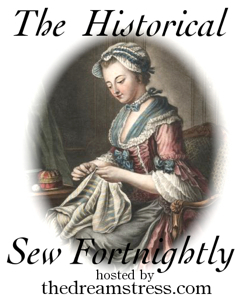 The “petticoat” is also sewn to the waistband and runs from the sideseams in the front. 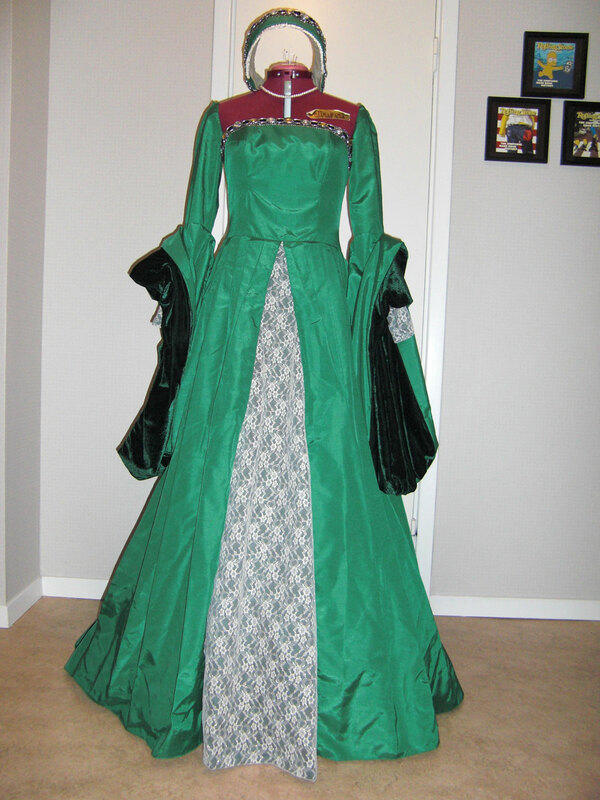 The whole dress are lined with green polysester lining, and decorated with a ribbon with plastic gemstones. 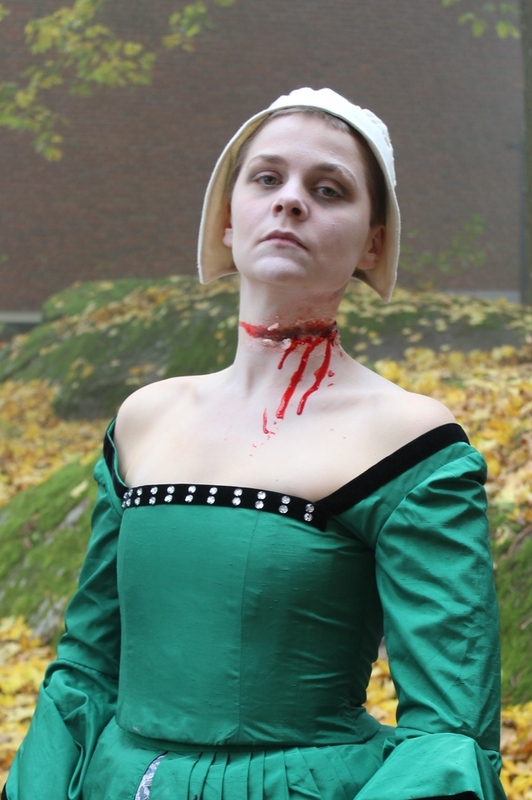 I also made the “french hood” and the “Boleyn necklace” to go with the dress. This is what it looked like on my dressform. At the time I vas really proude of the dress and tought it was beautiful. 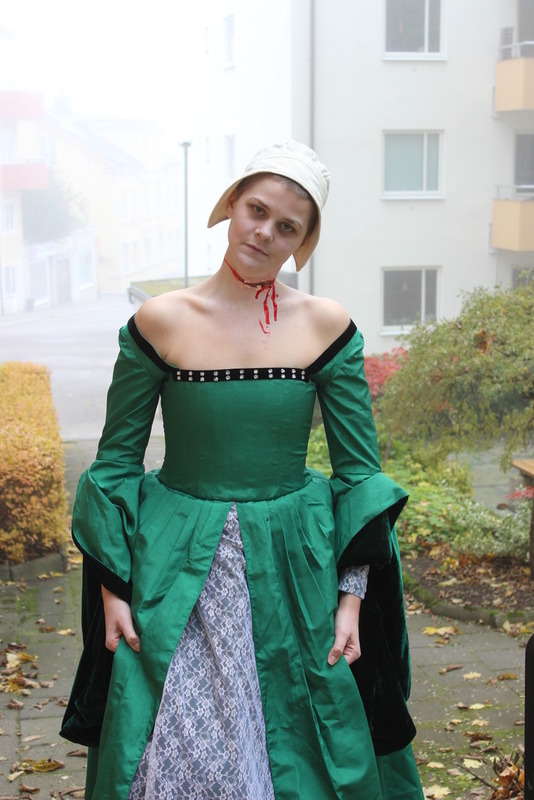 A couple of years later (when I learnt a bit more about historic clothes) I really hated it, and decided to redo it. So i ripped the skirt from the bodice and re-pleated it to a waistband, and made the petticoat as a separate piece. 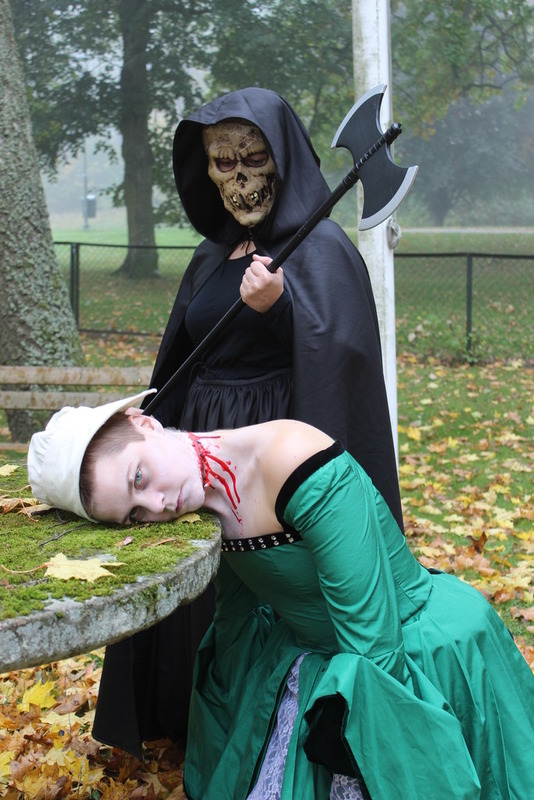 I also made sure the skirt would fitt over a bumrole and petticoat. I ripped the bodice opened and got rid of the curved bust seams, boned the front and cut some shoulder straps to attach the sleeves on. I also took out the zipper in the back and replaced it with lacing. I changed the decoration-band on the front and hood to a velvet ribbon and sewed on smal gemstones. 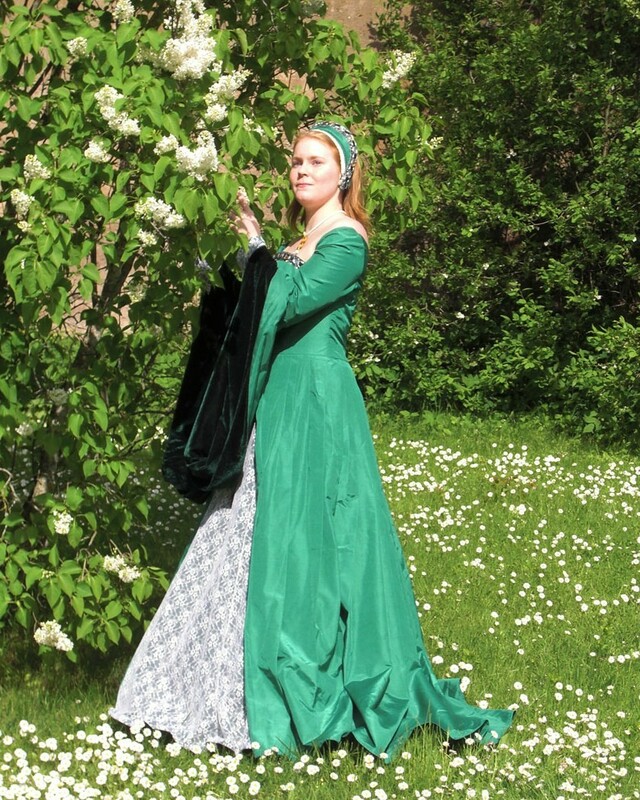 I will probably try to redo this dress again some day, or at least re-use the fabric as I still think the colour is wounderful.